I have worked with a number of interior designers in Bangalore, Delhi, Gurgaon, Kolkata, Mumbai, Pune, Hyderabad and other major cities in India. And I am well placed to help you calculate 3 BHK interior design cost in Bangalore and help you figure out the expense of getting your flat designed and furnished professionally. I often receive this question from our users in Bangalore about interior designing cost and how to calculate the cost for interior designing of a new flat, I thought of writing this post. Even if this post is about the Interior design cost in Bangalore, you can use same approach to calculate tentative cost of interior designing of 2-3BHk flats in other cities across India. The costs will be nearly the same. But before we get in to the details of actual 3 BHK interior design cost in Bangalore, I would like to give you a brief overview of how to calculate the cost; what are the things that one should keep in mind and where you can cut the cost and what are the areas worth spending a little more. In general, there is no end to work that can be done while constructing, designing or decorating your home. There are so many things that can be done, while decorating your flat. Today, we are living in a world of smart home, where things can be controlled with a voice command or by pressing a remote button. Naturally, it all comes with a cost and all these fancy functionalities may not suit the lifestyle of every one of us. So what are the major things one should know and consider when calculating interior design cost? Well, there are many things from your lifestyle to functional needs and budget, but here are the most important factors to consider when calculating interior design cost. This is the most important thing to consider while designing and furnishing a home. Is it your first home where you want to move in after decorating? Or this is the second home that you want to rent out for next few months or years? If it’s your first house and you want to move in here, then it is worth investing the money in good quality materials and getting it fully furnished. But if you plan to rent it out, then it may not be worth spending too much of money on designing and decorating the flat. You can use the fund to pay your loan or make wise investment and grow your money. If the purpose of the flat is to rent it out, then doing bare minimum work like a modular kitchen, simple wardrobe and bed should be good enough. In order to calculate the interior design cost in Bangalore or anywhere for that matter, you got to consider the purpose and use of the flat. Knowing the purpose well in advance will help you greatly in figuring out the interior budget and overall interior design cost. As I said, the major portion of your interior design budget is going to be spent towards custom made furniture. Custom made furniture helps you to utilize the space in best possible way and since it is custom made, you have total control over the quality and finish of the product. It’s always better to use custom made furniture than buying readymade processed woods furniture. Once you know whether the flat is for yourself or you want to rent it out, the next step is to figure out about the custom built furniture you may require. Ideally, you would like to have a modular kitchen, wall to wall wardrobes in at least two of the bedrooms, simple double door wardrobe in the guest room, small study desk in two bedrooms, a Tv unit, shoe rack, temple etc. Again you got to decide based on purpose and use of the flat. You may already have a sofa set, dining table, chair, etc or you may like to go for a fresh one. Each of the furniture items is going to cost you, so you have to be a little sure about what you want, what you already have and what can be reused/re-worked as per the new design theme of your flat. For instance, while a friend of mine was decorating his new 3 BHK flat for self, I suggested him to reuse one of the wooden wardrobes that he already had and place it in the guest room. So all he did was, just replaced the laminate as per the design theme and no one can even guess that it’s an old wardrobe. And it helped him save money that he spent towards the overall interior cost of the flat. Now as you know, the majority of the interior work goes in making customized furniture, what kinds of raw materials you want to use can make lots of difference in your budget. And there are so many brands of plywood and laminates. Depending on the type of plywood, laminate, adhesive, hinges etc you want to use, it is going to affect the overall cost of interior design of the flat. So there are commercial ply woods available at the rate of Rs. 60 per square feet and there is premium quality plywood that may cost well over 125 per square feet. So which ply or kind of materials you want to use can hugely impact the overall cost of interior design of a flat. Ideally, you should be using different kind materials for different areas of the house. For instance, it’s always better to use marine grade plywood for all of the furniture and cabinets in kitchen. Similarly, you should use good grade ply for bed because that’s going to be heavily used. But there is no point in using the premium grade plywood for a TV unit or a panel work, especially when you are on budget and you want to save more money. Talk to the interior designer and take their expert advice, they can share their expertise and suggest which kind of materials should work well. Similarly, if you check the ranges for curtains, you will find that there are basic materials and there are premium curtain fabrics. Now which one you want to buy will depend on your budget and your lifestyle. Ditto for Sofa fabric and other materials like a chimney. There are so many brands and range to choose from and you can figure out what is going to work well for you only when you see the materials and hold it in your hands. And the best approach to find the kind of materials that’ll suit you is to go to the market, meet the supplier, survey and evaluate the materials and you will be able to figure out what is best for your budget. Usually, we end up choosing the good quality materials, even if it’s a little costlier than the initial budget, but that’s okay. If all of these sounds like too confusing and overwhelming, then worry not, because this is where the professional interior designers are going to add value. Wondering how? Check out the next section. May not sound like a big deal, but trust me, it is. There are the usual local “Mistri Jee” who make all types of furniture. And then, there are carpenters who work with interior contractors and architects. There is huge difference between the finish quality of a local carpenter and an experienced carpenter that works under interior contractor and architects. Craftsmanship is an essential factor and you should look engage the best available, if you strive to get the best finish. Interior designers employ experienced carpentry team that can build flawless furniture as per design. Naturally, it’s going to cost you a little more than what a local carpenter may charge, but then what’s the point if after spending so much of money, you won’t get that elegant and luxurious living? Usually the carpentry work is done based on per square feet area and there is different rate for different type of furniture. So for instance they may charge at the rate of Rs. 220 per square feet for bed and 320 for cupboard. But in general good quality carpenter may charge you on an average Rs. 300 to Rs. 350 per square feet in Bangalore. And rates for carpentry work in other metro cities are nearly the same. These are some of the major factors worth consider while calculating the cost of interior design services in Bangalore and other cities in India. What is the standard 3 BHK interior design cost in Bangalore? Now that you know about a few of the important factors to consider when calculating the interior design cost in Bangalore or elsewhere in India, I am sure you would like to know how much it may cost to do full interior in a 3 BHK flat in Bangalore. The short answer is around Rs. 600000.00 to 750000.00. If you are looking to design a standard 3 BHK flat with good quality materials and finish, then that’s the tentative cost you should look at. But then, alternate approach is to break the cost and get the work done according to your budget. Ideally, to calculate the interior design cost in Bangalore or other metro cities in India, an interior designer or interior contractor would like to meet you in person to discuss and understand the purpose, your lifestyle, budget etc and then calculate the cost. They would like to know the purpose, your functional requirements, major furniture you may need, kind of materials you want to use and then after taking measurements of the space, they’ll be able to give you the quotations. And that’s probably the best way to get a very close quotation. Interior designers usually like to meet the client face to face, discuss their functional requirements, lifestyle needs, budget etc. They also like to measure the carpet area and then calculate the interior design cost and send quotations. But to give you some tentative idea of the 3 BHK interior design cost in Bangalore, I am assuming that’s it’s a 3 BHK flat, with a carpet area of around 1000 square feet (not the fat size that builder have mentioned because that’s super build area), and you are looking for medium range of plywood and laminate which are value for money. 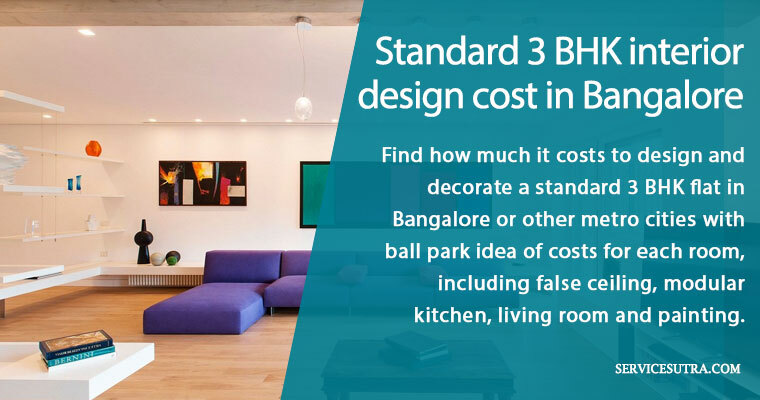 Here’s the tentative cost breakup for standard 3 BHK interior design project in Bangalore. You can tentatively assume it to be the same in other cities as well. False ceiling is something that completely transforms the overall look of your space. Be it in the living room or bedroom, a properly designed false ceiling with ceiling lights is a must have feature. But then, there are many who think that false ceiling is essential on top floors only and hence they never go for it. So it’s totally up to you to decide if you want to have false ceiling or not. Cost of false ceiling usually starts from Rs. 70 per square feet to up to Rs. 125 per square feet, depending on the complexity of design and materials being used. As far as POP and Gypsum boards are concerned, the cost is nearly the same. The cost increases or decreases due to the quality of the frame and finishes. For lighting, if you are doing false ceiling, then you should go for ceiling lights. But if you are not getting false ceiling done, then you can go for modern designer wall lights as well. It’s going to look equally good. Pro tip: you may like to do ceiling towards the wall and use ceiling lights. Since you are not doing ceiling from end to end, you will be able to bring the cost down drastically. Wardrobes are the most essential investment you are going to make while designing your home. You can’t do without wardrobes and it’s a must have. Apart from being essential, properly designed wall to wall wardrobe in one side of the bedroom can make the room look good. Pro tip: If you are on a budget then you may like to do smaller wardrobe in the guest room and save on the costs. I personally recommend going for a new customized bed with side units or side table. The bed can have one pull out trolley and three fixed boxes or it can be divided in two part, one as pull out and one as a fixed box. It really depends on the space available for pull out section. Usually a modern design bed and wardrobe makes a room look good. But if you have an old bed and want to use it, you can always do so. The interior designer on board, should be able to suggest ideas on how to reuse the bed, by making minimum tweaks which may include changing the color, replacing the laminate or a bit of physical alteration. Standard cost for 3 beds of standard size (6×7 feet) with side units: Rs. 103950.00 to Rs. 119700.00 based on the quality of plywood and laminates. Pro tip: if you have a good quality bed, you can talk to the interior designer and retain the same to save interior design costs. Modular kitchen is a must for a new flat. Whether you are planning to move in yourself or you want to rent it out to someone, getting modular kitchen cabinets can dramatically improve the functionality and utility of your kitchen. Even if the size of your kitchen is not too big, if you install over the top and below cooking counter cabinets, then it will look much more organized and spacious. Pro tip: Whether you are designing the flat for your own use or you want to give it on rent, you must use the best quality materials in the kitchen. The reason is, kitchen is going to be used heavily and roughly. It’s the busiest room of your house and it’s going to remain wet most often. So it’s best to use marine grade ply in kitchen cabinets, which is ideal for kitchen or areas that often remain wet. Marine grade ply woods are going to be a little costlier than the usual commercial ply, but every penny you invest in the kitchen plywood is worth it. Similarly, when buying hinges, handles and other fitting materials, go for the best you can get in your budget. Sofa set is another must have in your living area. Ideally you can get custom made sofa set based on the layout of your space. But these days, you can order sofa set online or you may like to visit a store and place an order. The offline furniture store can also send their technicians to take the measurement and then based on the design you have chosen, they can quote you a price. The way you can order sofa set, you can order dining table as well. You can directly order from a store or if you want the interior designers can get customized dining table and chairs made for you. There are so many options for dining table and chairs, you can put granite on top of the table or have wooden table top. I personally like wooden chair with back support, but these days you have plenty options as far as materials and designs for the dining table and chairs are considered. In any case, you can assume dining table and chair cost to be around Rs. 9000.00 to Rs 1150.00 per seat. And so the dining table and 6 chairs cost could be go anywhere between Rs. 54000.00 to 70000.00 in total. Pro tip: If you want, you can even apply wallpaper in the TV unit and that will reduce the cost to a good extent because the cost of wallpaper is way less than cost of laminate. Cabinets in the washroom can be of great use. You can use this cabinet to store soap, detergent; shaving kit, oil, shampoo etc and the door will have a window. Some of the flats will have two washrooms and other may have three washrooms. Costs for each cabinet can be anywhere between Rs. 7000.00 to Rs. 9000.00 only. Usually the developer will give you plain painted doors which are going to look ugly. When you are decorating your flat, then everything must be in synch and hence the need to put laminates or door masks. Door masks are usually a good and cost effective choice, I personally feel pasting 2.5mm plywood from both side and then laminating it as per the theme and color of your overall interior can simply transform the look of these doors. The cost for door lamination can be anywhere between Rs. 40000.00 to 5000.00 per door. Once the furniture work is done, there is a very little space left for painting. There are a couple of qualities available for paints as well and hence the cost of painting will depend on the brand and quality of paint you want to apply. I personally use Berger express, but the cost is nearly same for all of the leading brands like Asian Paints and all. Curtains are other important furnishing items that can transform the overall appearance of your rooms. I suggest use good quality fabric and get it professionally tailored. Interior designers can help and recommend the furnishing shop and even suggest designs. If you want a little more modern look, you can go for vertical blinds which may cost around Rs. 6500.00 to 7500.00 per window. Blinds are in trend these days and it really look modern and trendy. Then there are motorized blinds available as well, that you can open and close using a remote button. But, i personally find it hard to clean and maintain. Ideally, you have to call the technician to open an clean the blind, so keep that in mind while selecting between blinds and classic curtains. Over to you: how much do you think it would cost for a 3 BHK interior design in Bangalore? Interior designing is no more a costly affair, especially if you are open to research and involve a professional interior designer to undertake the project. Interior designers are professionally trained and have all the resources and contacts to design and furnish your home in your budget. But as with any other service or product, the cost of interior design and furnishing varies from project to project and person to person. What is a must have feature for you, may not be required by someone else. And hence, it makes sense to figure out your purpose, functional requirements, budget and then talk to a couple of professional interior designers , schedule a face to face meeting and survey and then request for quotations. Here’s a detailed guide on hiring interior designers in india, that i suggest you check. If you are planning to design a 2/3 BHK flat in Bangalore or any other city in India, and you are concerned about the costs of interior design and execution services, then you can figure out a basic budget by reading the post above. I have already discussed about various that is to be considered while calculating the cost of interior design services. To make things easier for you, I have also discussed costs for various rooms and shared pro tips on how to cut the cost. If you have recently designed your home and planning to design a new flat, then share your metrics and ideas on how to calculate the cost of 3 BHK interior design in Bangalore. If you have any other question, feel free to call us on 07044123404 and talk to an expert or share your concern by commenting below. And finally, if you like this post and think it will help a family or a friend, then please do share and spread the word. Previous Previous post: Buying a New House Vs Renovating Existing Home – Which is Better?